« Why do people stick to Job? Very often when we face this question, how do I better my sales figures? How do I approach people with what I have to offer them to help them with a product or service? Particularly people who have services to offer, for instance an IT consultant offers consulting on projects, estimation, migration of services, new product. A manpower consultant offers his advice on how to recruit talented people for the kind of job required in a company. The coach offers technical, leadership or personal coaching. A health consultant provides solutions to better one’s health manage weight, create more energy etc. Finance advisor advices on how to grow wealth and manage risks. The services offered by these people are unique, however many consultants still face the biggest challenge of attracting clients and growing their business. Some do immensely well in increasing their customer base, some manage to run slow but get a steady flow of new customers, while others struggle. Two people who have same skills, work hard equally why do they have dramatic difference in sales figures? To address this question lets understand the concept of Precession. Precession is term used in context with force applied on moving objects under the influence of gravity. The earth spins around the sun while the entire universe is exerting a perpendicular force on the earth. The net result is that its axis is tilted in rotation. Yet another example is of a toy top. If the axis of rotation of toy is not exactly vertical then the toy’s rotation axis gets tilted due to the gravitational force. The same concept applies to the purpose of any living being in this universe. It is explained by the above diagram. 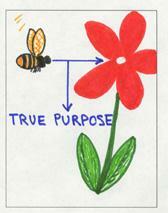 In the diagram the honey bee moves each day, collecting nectar from flower to flower, yet its true purpose is to cross pollinate. Similarly every human being has a true purpose to serve while he is doing his job. In this context, if your profession is sales or service or software programming or driving or cleaning, you are serving a higher purpose. This higher purpose is to serve people. We human beings are meant to help each other and grow together. Very often this purpose is forgotten in the quest to earn more, to outcast someone or simply to survive. This competition creates what we commonly call STRESS. Stress is the single most reason for discomfort or disease. 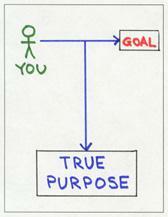 The STRESS is created when we ignore our true purpose while doing our work. There’s no end to competing and don’t get me wrong, I am not against competition. A healthy competition would lift up one’s spirit. So, to grow the customer base, one simple mantra that is practiced by those that are successful in their business, service is to exceed expectations. This is a big term as it may sound, yet it is simple. Suppose you are a coach and your job is to coach people on various subjects. While you teach people to gain knowledge, apply skills at work, get better at their job, what are you actually doing? You are serving people to get better in their life. You are helping them to know how to be independent, how to learn the art that would either fetch income or create more peace or better their health. This is your true precession. How to exceed expectations? Do not just coach them, mentor them. Spend weekly 10 minutes of your time with them to understand how they are doing, did they apply what they learnt, help them achieve their goals. In service industry, giving more value to the client creates an edge. While the world is going through recession and there is pressure to reduce price, what actually is required is to deliver more than what the customer has paid for. This will create raving fan base. They would recommend your service to others. If you like a movie don’t you recommend it to your friend, family? It’s the same. People pay for value.